Praying mantids are well-known predators we often see lurking around gardens, landscapes, and sometimes near porch lights, waiting for a tasty meal to arrive. Praying mantid adults are 2 to 4 inches (5-10 cm) long and are usually yellowish, green, or brown. Mantids (often referred to as praying mantis) go through incomplete metamorphosis (egg, nymph, adult) and have one generation per year. Overwintering eggs are laid in groups in hard, grayish egg cases which are glued to wood, bark, or other plant material. Adults and immatures (nymphs) have an elongated thorax and grasping forelegs, which they have the habit of holding up while waiting for prey. Mantids are wholly predaceous, feeding on many kinds of insects including beneficial insects and even other mantids. They often wait for prey at flowers where they capture nectar- and pollen-feeding insects. Mantids grasp their prey with spined front legs and hold them while they eat. As mantids consume both pests and beneficials, they are difficult to use reliably for biological control. 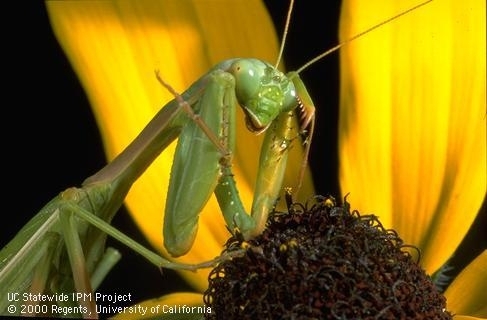 For more information about mantids and other beneficial predators, visit the UC IPM Natural Enemies Gallery.